Marvel at sunrise over the magnificent Angkor Wat before moving to a special location for a champagne breakfast with food prepared by a local NGO supported bakery school. Freechoice: Discover the temple of Banteay Srei and Landmine Museum or explore Beng Mealea temples and the Artisans D’Angkor Handicraft Centre. 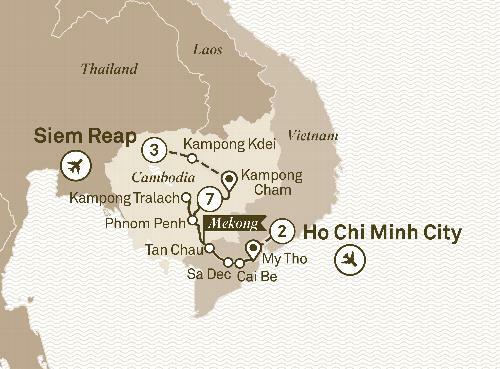 Alternatively, cruise on Tonle Sap or ride a tethered balloon before visiting a Pouk Silk Farm and Preah Khan Temple. For the more adventurous enjoy a vintage Vespa ride. Receive a blessing in the pagoda from a monk and learn how to pray in a Buddhist pagoda before giving a donation which contributes to the daily meal of the resident nuns and monks. Freechoice: Journey to the Killing Fields and tour Tuol Sleng, or tour the local food market before joining a hands on Khmer cooking demonstration. Alternatively, by Tuk Tuk explore Phnom Penh’s colonial buildings, the Central Market as well as its modern architecture. Drive to Ho Chi Minh City and enjoy an orientation tour around the attractions near your Special Stay hotel for the next two nights. Spend the remainder of the afternoon at leisure. Discover the essence of South East Asia on a 13 day journey from Ho Chi Minh City to Siem Reap on board Scenic Spirit. Explore Wat Hanchey and Phnom Penh. Search out the abode of the ‘god kings’, the 12th century masterpiece that is Angkor Wat before embarking on your cruise towards Vietnam. Along the way take in the wonders of the Cambodian capital, Phnom Penh, explore its jumble of streets, local markets and traditional handicrafts. Zoom along the waterfront in a tuk tuk, visit the National Museum, Royal Palace and Silver Pagoda before returning to the all-inclusive luxury of your ship as you glide over the border into Vietnam. Travel on local sampans, discover the historic town of Tan Chau and spend time at the Cao Dai temple before wending your way to lively Ho Chi Minh City.